What Is M4A? M4A vs MP3? Is M4A Better than MP3 or Not? 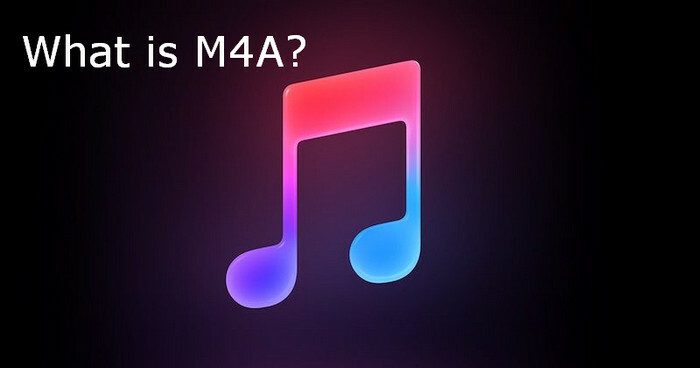 This page focuses on what is M4A on earth, M4A vs MP3 comparison, and differences between M4A and MP3. People are easily confused with some common audio formats, especially have confusion about M4A and MP3 audio. Actually, audio file formats can be divided into three major groups: Uncompressed audio formats, like WAV; Lossless compression audio formats, such as FLAC, ALAC, WMA Lossless; Lossy compression formats, incl. MP3, AAC, WMA Lossy, Vorbis. In this article, we will mainly introduce you the increasingly popular audio format M4A, including what is M4A format; M4A vs MP3 comparison, which one is better; as well as how to convert video to M4A audio with a professional video to audio converter. 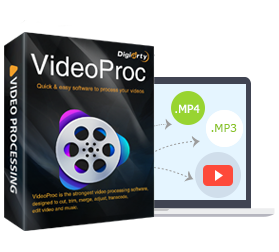 VideoProc: Convert between any videos and audios; convert M4A to other audio format or vice versa; convert any video to M4A (AAC/ALAC), MP3, AC3, WMA, iPhone Ringtone and other audio formats at No.1 fast speed with original sound quality. -	M4A file is compressed while with lossless quality, which means you get smaller file with original quality. -	M4A audio can be set as iPhone Ringtone directly just by renaming the file extension from M4A to M4R. -	As the M4A audio file is not protected, so it can be easily streamed or distributed with no licenses or payments. -	Poor compatibility: developed by Apple Inc., M4A is mainly applied to iTunes, iPod and other Apple devices and can't be widely played on many other popular devices. What Players and Devices Can Open and Play A M4A File? M4A vs MP3: Which One Is Better? M4A vs MP3: M4A is generally regarded as the successor to MP3 but compared with MP3, M4A can compress audio with the same bit rate in smaller file size. M4A format files typically have stereo bit rate of 128kbps, 192 kbps or 256kbps. By the way, Bit rate is the amount of data that is conveyed per unit of time. In the aspect of quality, an M4A file with ALAC codec has the best original sound quality. Even M4A (AAC) delivers better quality than MP3 audio at the same bit rate. As for the file size, it is also related to the bit rate, the larger bit rate, the larger file size, the better sound quality. To put it another way, if you try to get the same sound quality, you need 256kbps bit rate when encoding with MP3 while only need 192kbps with M4A, as a result, you'll get a much smaller audio file size with M4A. However, MP3 is still the most popular audio format thanks to its much better compatibility. It's arbitrary to say that M4A is better than MP3, choosing which audio format still depends on your own needs. For Apple fans, you may favor M4A file and choose to convert video/audio to M4A, but for those who want to play audio on Android Samsung, HTC, etc. may want to convert video to more friendly audio formats like MP3. An all-in-one video converter VideoProc can convert between audio video formats, or extract audio from videos/movies in various audio formats, enabling you to convert MKV, H.265, AVCHD, AVI, WMV, MOV, MP4, etc. to M4A (AAC), iPhone Ringtone, MP3, AC3, FLAC, ALAC, WMA, WAV, etc. at fastest speed for easier playback on PC, Mac, iPhone, iPad, iPod, Android Samsung and other mobile devices. Free download, install and launch this audio extractor on your PC/Mac (free download Mac version), then follow the 3 steps below to extract audio from video easily. 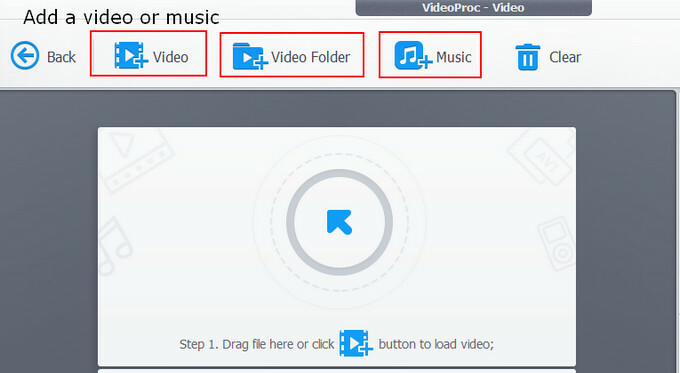 Step 1: Select "Video" on the main interface, click "+ Video", "+ Video Folder" or "+ Music" to load source video, video folder or music file stored on hard drive. Step 2: Select AAC (M4A), MP3, iPhone Ringtone or other audio files as the output profile. You can adjust the audio parameters before converting. Step 3: Click "Browse" button to specify a destination folder to store the extracted audio file. 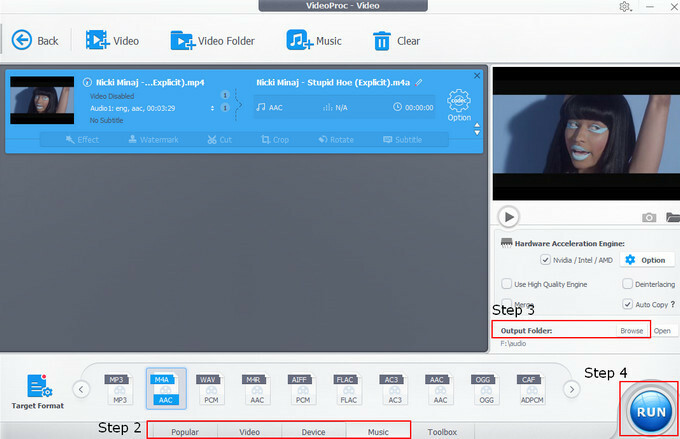 Step 4: Tap "RUN" to start to convert video/audio to audio (here is an example of converting MP4 to M4A). The best all-in-one video converter and audio extractor to convert any audio to audio, and convert any 8K/4K/HD/SD video in any format to MP4, AVI, WMV, MOV, FLV, or to M4A (AAC), MP3, AC3, iPhone Ringtone, ALAC; iPhone, iPad, Android, and almost any other formats/devices for playback. Learn how to convert M4V to MP4 for more Apple devices with no Apple ID restriction, and for non-Apple devices like Android phones/tabs, PSP etc. Advanced Audio Coding (AAC) is a standardized, lossy compression and encoding scheme for digital audio. Designed to be the successor of the MP3 format. Convert video to audio (MP3, FLAC etc.) with the best video to audio converter for Windows (10) and Mac. Home > Resource > What Is M4A? MPEG4 vs MP4: What Is the Difference between MP4 and MPEG4?